In Greece, underwater excavations of Lechaion, ancient Corinth’s partially submerged harbor town, reveal the infrastructure of more than a thousand years of flourishing maritime trade. Researchers from the Greek Ministry of Culture and Sports and the University of Copenhagen are using cutting-edge methods to uncover the configuration and scale of the harbor. Corinth, which lay some three kilometers from the sea, built on this natural advantage by constructing two harbor towns – the main harbor Lechaion on the Corinthian Gulf to the West, and Kenchreai on the Saronic Gulf to the East (see map to the right). 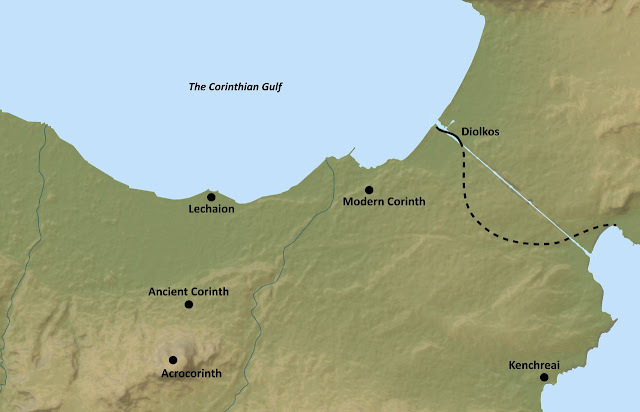 "According to ancient sources, most of the city's wealth derived from the maritime trade that passed through her two harbors, eventually earning her the nickname ‘Wealthy Corinth’," says archaeologist Bjørn Lovén from the University of Copenhagen and co-director of the Lechaion Harbor Project (LHP. Lechaion’s extensive underwater ruins lie nearly untouched, but that picture is changing. 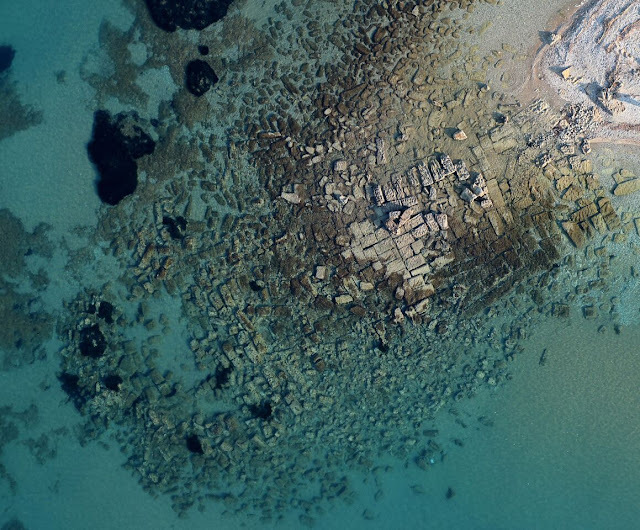 The Lechaion Harbour Project (LHP), a collaboration between the Ephorate of Underwater Antiquities in Greece, the University of Copenhagen, and the Danish Institute at Athens, has undertaken an exploration of the submerged main harbor of ancient Corinth. The research team has initiated full-scale excavations and a digital and geophysical survey of the seaward side of the harbor using various innovative technologies, including a newly-developed 3D parametric sub-bottom profiler. To date they have uncovered two monumental moles constructed of ashlar blocks, along with a smaller mole, two areas of wooden caissons, a breakwater, and an entrance canal that leads into Lechaion’s three inner harbor basins. “We have found and documented several monumental architectural structures, built at great expense, showing that Lechaion was developed as a grand harbor to match the importance of her powerful metropolis, Corinth,” says Bjørn Lovén. 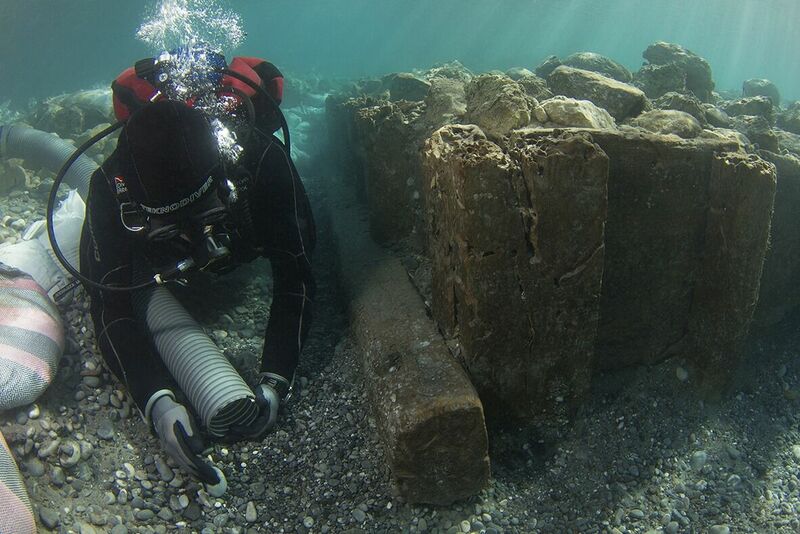 Roman imperial engineers employed a similar technology on a large scale at Caesarea Maritima in Israel in the late first century BC, but these are the first of their kind ever discovered in Greece with their wooden elements still preserved. A preliminary C-14 carbon date places the caissons in the time frame of the Leonidas Basilica, the largest Christian church of its time. Construction of the basilica began in the middle of the 5th century AD. It was 180 meters long – about the same size as the first building phase of St. Peter’s Basilica in Rome. Scholars generally assume that harbor facilities in the Mediterranean were built in the Greek and Roman period, then simply repaired and maintained during the Byzantine period. The discovery of the mole constructed of wooden caissons challenges this picture. The mole is a rare example of major harbor construction in this later era, but it may be indicative of a larger pattern of more ambitious harbor construction in this period, such as the Theodosian harbor (modern Yenikapi) at Constantinople which has recently been excavated. Is it possible that the construction of this immense edifice coincided with renewed buildup of the harbor, thereby facilitating the arrivals and departures of visitors and pilgrims? At all events, the benefit of these innovations was short-lived, as Lechaion and its basilica were destroyed by a massive earthquake in the late 6th or early 7th century AD. Vestiges of the ancient entrance canal have been exposed on the modern beach for years, so there has been little doubt of its location. The scale, however, was surprising. So far, the team has uncovered some 55 meters of its sides, which protected ships coming into and exiting the three inner harbors of the town. And the team has also found evidence that the ancient harbor was likely located much farther to seaward, perhaps as far as 45 meters from the modern shore. A geophysical study is underway to understand how the site has evolved over time as a result of sea-level change and possible coastal subsidence. According to Bjørn Lovén, the Lechaion Harbor Project is endeavoring to advance our understanding of how this bustling harbor evolved over time and enabled the development of Corinth as a major economic and military power during the Greek, Roman and Byzantine periods.